It might make some sense to resume this blog where it left off, with a further reference to the ongoing work on Dundee writing in the 19th century. At the Dundee Literary Festival the other week, Professor Kirstie Blair and Erin Farley did a sort of double act lecture+reading from the excellent Poets of the People’s Journal, published by the ASLS. I re-read Professor Blair’s intro the following morning, thinking how extraordinary it still seems that so much engaged, often radical, sometimes experimental, working class Scots verse was overlooked for so long, and reflecting on the causes. One element was certainly the ephemeral nature of the publication itself. Despite its massive circulation of a quarter of a million at its peak, and taking into account Kirstie Blair’s estimate that every copy sold may have had up to ten readers, and despite the fact that its editor, W.D. Latto, produced the paper on a weekly basis for almost forty years (1860-98), the People’s Journal was still ‘just’ a newspaper, and its grip on the cultural consciousness has faded rapidly since the first part of the 20th century. And yet that editorship was radical by conviction, encouraging, as the intro states, ‘working men and women to participate in a topical, politicised, satirical and self-aware literary culture…’ Poems on elections, political reform, local injustices, imperialism, industrialism, sexual mores – the diversity of the material, even in the tiny sample she could anthologise, is remarkable. There is a possibility, realised here, that the ongoing responsiveness of an ephemeral mode of publication, if aligned to a liberal editorial position, can enable the voices of the otherwise marginalised to be heard, if only within that forum. Then the forum itself can become a way of nurturing community. My first glimpse into this radicalised version of the ephemeral was William Donaldson’s AUP book, Popular Literature in Victorian Scotland (1986), where the voice that leapt off the page for me was Latto’s own, in the guise of Tammas Bodkin, a Dundee tailor who expressed himself in a rich and stylish Scots on an impressive range of subjects. This relation between public persona and literary mouthpiece – and between Scots and English – is also present in John Wilson’s masterpiece of polyphony from the first half of the 19th century, the Noctes Ambrosianae, in which his voice, in the form of ‘Christopher North’, is pitched against the irresistible if ventriloquised Scots of ‘The Shepherd’ (James Hogg). There is an interesting parallel here in terms of how we might read two of the poets in the anthology: ‘Poute’ (a pseudonym for Alexander Burgess), and the Great Synecdoche for Dundonian poetry, William McGonagall himself. Poute’s phonetic Scots antipoetry, which was enormously popular when it appeared in the Journal, parodied middle class perceptions of rural and working class verse (and indeed of poetry), and was a sort of Post-Ploughmanism. This sort of sophisticated ‘bad’ writing that transcends its own in-jokery was only possible within the community of the Journal, where editors and writers alike could reflect wittily on literary tropes, the editorial process, and the economics of publication. But as Kirstie Blair points out, it also intriguingly prefigured McGonagall. With Poute the remarkable thing is how he manipulates phonetic spelling to communicate his subtext to the reader. The issue with McGonagall, however, is precisely that we can’t determine how far he’s being deliberate in what he’s doing – is he even just copying how to be ‘bad’ because that’s how to get into print? Except, of course, that both on the page and in performance, it works gloriously in terms of pacing and punchline. It’s important to note both this element of subtle humour and the ambivalence of intent alongside the lively politics of the Journal. (As Erin Farley put it regarding the political slant, ‘I have been looking for several years for poetry from Dundee supportive of the Tory Party – none has been forthcoming’.) 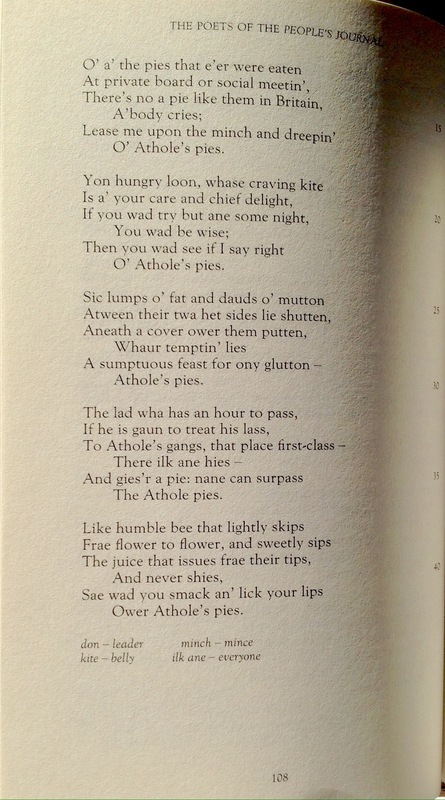 ‘Athole’s Pies’, by ‘Factory Muse’ (probably Adam Wilson), not only encapsulates the sly silliness of writers like Poute – and possibly McGonagall – but is probably the maist Dundonian poem ever written. Those without a funny bone might describe poetry like this as ‘pawky’, and, as with the term ‘whimsical’, this seems almost dismissive: just as we’re not quite sure about its author, so too we don’t know whether this is a genuine poem-as-advert, but there is an exuberance to its language and handling of the totemic Standard Habbie which transcends commercialism. I was struck several times during the event by this sense of tonal and formal self-awareness, and thought I saw some parallels with the presentation of poetry in Ian Hislop and Nick Newman’s play, The Wipers Times. There it’s mock-dismissed, but many of the same characteristics are manifested: soldiers turned in the trauma of war to poetry, satire, self-referentiality, whimsy – the traits of the ephemeral. It seems reasonable to propose that this happened because, pre-war, they were accustomed to papers like the People’s Journal providing them with just such a playfully subversive platform. In the period after the First World War, in order to clear his own Modernist space, MacDiarmid drove a nail into the coffin lid of all such poetry by implying it was either endless Kailyaird or McGonagallese, sentiment or dross. And yet, trained as a journalist, he deployed exactly the same tactics himself: founding a newspaper in 1923, The Scottish Nation, creating pseudonyms, and working with traditional forms and orthographic Scots, rather than, as Pound advised with the pentameter, breaking the ballad. The coffin itself, however, was constructed by the merger in 1905 of Leng & Co, which owned the Journal, with the decidedly conservative firm of Thomson’s. One of the most remarkable aspects of the history of the People’s Journal is how absolutely that culture was coutherised* by D.C. Thomson’s, so that growing up in Dundee through the 1960s, and beginning to write in the 70s and 80s, I’d practically no idea we had that lively political poetic heritage, and none at all that it had ever been manifested in that staidest of manifestations of staidness, the Journal. In the early nineties, when Richard Price and I were editing Gairfish, inspired by Tom Leonard’s Radical Renfrew, and following a lead given by Edwin Morgan, we published a couple of poems in the Whitmanic mode by the Dundee and Alyth poet, James Young Geddes. He was also the subject of a 1992 essay by Valentina Bold, and formed a third part of a study of late nineteenth century poets from 2004 by Gioia Angeletti, Eccentric Scotland (the others being two long term fascinations of mine, John Davidson and James ‘B.V.’ Thomson). His poem, ‘Died on the Street’, reprinted in Poets of the People’s Journal, is a typically trenchant indictment of the alienation he saw in industrialised Juteopolis. Gradually, through studies like Bold’s, Angeletti’s, Donaldson’s, and Professor Blair’s, we’re recovering some perspective on the cultural heritage and genuine poetic achievements of the Radical Toun. Lang may its verse mills roll! *Like ‘catharised’ but, instead of cleansing, removing all traces of the potentially alarming or objectionable, leaving only that which is familiar and comfortable, or ‘couthy’. A marvellous summation of the role of poetry in Dundee’s past and present. As part of the launch for our anthology, Whaleback City, I did a poetry walk with Andy Jackson a couple of years ago for the Dundee Literary Festival, and had great fun. And Andy and I have been talking about a poetry map to illustrate what Erin is saying here – Dundee’s streets may not be paved with gold (here and there it’s mair likely tae be needles), but metaphorically they are lined with poems, and that should (as in her post) be celebrated. 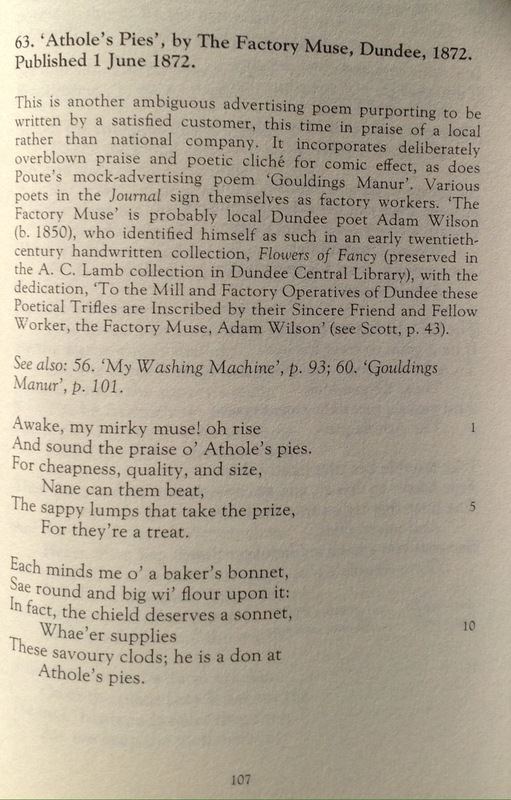 This post was written by Erin Farley, a second year PhD candidate at the University of Strathclyde on the Collaborative Doctoral Award project “Poetry, Song and Community in the Industrial City: Victorian Dundee,” in partnership with Dundee Central Library. Her research focuses on how the composition, performance and reception of poetry and song reflected and influenced people’s relationships with place. She has previously worked in the fields of oral history and folklore studies, and is also a traditional storyteller. She is on Twitter @aliasmacalias. The panel I took part in on translation at last week’s Newcastle Poetry Festival raised a number of issues of equal fascination to both poets and translators, and, one would hope, readers of both. I found myself as excited by the far-ranging nature of the discussion, and the diversity of approaches of the panel, as I was impatient to think through how it related to my own practice. From Jean Boase-Beier’s intense engagement with the text, usually solitary, usually focussed on the work of dead poets, trusting to etymology to deepen her investigation, to Erica Jarnes’s discussion of the responsibility of the translator to engage with and represent work outside the Grand Old Men of European heritage – thinking in particular of the Poetry Translation Centre’s representation of the poetry of minority, usually, immigrant, cultures within that European context; from Fiona Sampson’s subtle distinction between the meaning of the words in a text and the implications for meaning created by the text as a whole – moving away from what the words ‘mean’ to looking at how the cultural context of the poem independently generates meaning – to Sophie Collin’s careful deconstruction of what we mean by terms like ‘literal’ and ‘fidelity’ – it was an exciting and stimulating discussion. Having worked with PhD students on the related topics of ekphrastic poetry, and the incipient poetry of the translation literal, I was struck by the continued relevance of the ‘Three Kinds of Translation’ listed in Sophie Collin’s anthology Currently & Emotion, which refers to Jakobson’s categories of interlingual, intralingual, and intersemiotic translation. While we were effectively focussed on the first of these in our discussion on Saturday, and while ekphrasis would be ‘the most recognisable example’ of the third, I’ve been most concerned recently with the second, ‘an interpretation of verbal signs by means of other signs in the same language’ (Jakobson), or ‘any approach in which a text is adopted to a new purpose within the same language, with famous examples including erasure texts and paraphrasings’. Essentially, as mentioned in previous posts, I’m translating the ‘Monolog Recreativ’ chapter from The Complaynt of Scotlande. What I mean by this is a sort of four part composition, a quartet of sorts, or rather a quadrilogue (as indeed is Wedderburn’s original text) in which four textual strategies are set side by side. I’ll discuss those strategies later, and will focus first on an aspect of intralingual translation which I found impinged most directly on my other main translation project, the Poettrios Experiment, where we are investigating how translations are generated by a trio of source poet, target poet, and language advisor. In order to include any Scots poems in those batches of work I send out for translation before an international festival, I usually have to include my own literal or interlinear to enable the translator to approach the original. Scots combines differences in spelling, grammar and vocabulary which one can’t expect someone used to translating from English to feel they have the necessary expertise in, while its proximity to English arguably places such literals somewhere in the intralingual category – but where? It might seem easier to leave it out. 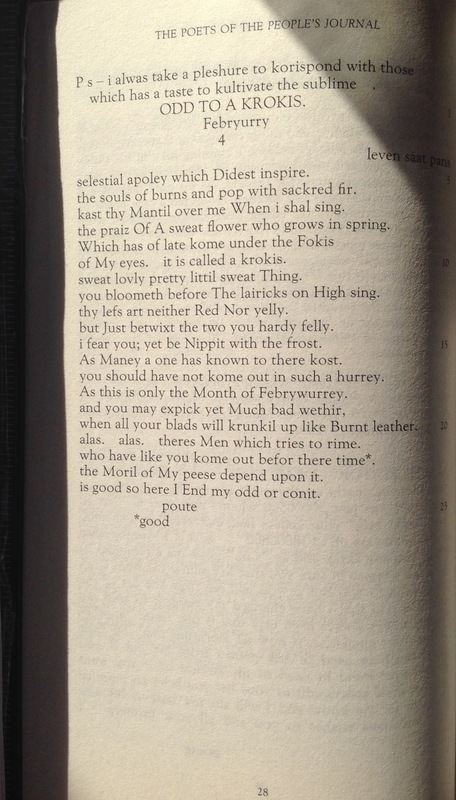 To set aside all such work, though, is to present a simplified version of the poetry of the British isles – English’s dominance as a world language can seem to manifest itself as a matter of tensions about what is grammatically correct or stylistically elegant, rather than as an exercise in power, a monologue from the motherland which denies that it also functions as a complex plurality of modes (which may or may not include such significant literary units as Scots). So it was with a heightened awareness of such matters that I was in the midst of preparing literals, notes, and glosses for the Poettrios project (the British poets involved, who include Fiona, will in our first session be translated into Dutch, and in the second, will translate from it), when I realised that I had stepped over a boundary between saying what a Scots word meant, and explaining its cultural and literary context – certain words seemed to demand both explanations, till I noted this was a luxury of exegesis not extended to my fellow poets. The point about certain Scots words therefore carrying both literal meanings and strong cultural connotations hadn’t occurred to me in quite those terms. Of course all language does this – consider the nightingale – but in terms of that interrelation between Scots and English, some words were evidently symbols of almost-separate-but-proximate heritages, generating complementary but different interpretations for Scots and non-Scots. I won’t refer to any of the Poettrios texts here for the same reason that I then pulled back in my interlinears from explaining the literary and cultural context of certain words – so as not to pre-empt the discussion in those translation sessions. But I can give an example from my work on the ‘Monolog’. In a much earlier poem – among my first work in Scots, written back in my 20s – I’d referred to a sort of intralingual pun, where a word from my reading echoed one from my upbringing, bringing my literary and local heritage into an odd relationship. In the ‘21st Doldrum’, from a sequence of poems about the social and spiritual stagnation I felt had taken hold of my home town of Dundee in the first flush of Thatcherism, I referred to a story I’d been told by a policeman – a representative of, in Scots, the polis – of recovering the body of a suicide from the River Tay. ‘Polis’-man as unit o thi Burg. When I was re-reading the ‘Monolog’, however, I came across a third iteration of this pun, this time more properly intralingual. The ‘Actor’ or author, taking a stroll between writing their introduction and the opening scene of the quadrilogue (a vision of ‘dame Scotia’), recounts in encyclopaedic detail everything they see and hear, a far from restful listing which includes catalogues of birds’ and animals’ cries, an account of a sea battle, lists of tales, songs and dances (some extant, some extinct), and a mercifully brief account of the herbs they see as they fall asleep in the grass. in our hemispere be rason that it is vndir our orizon. The idea that one word, ‘polis’, could have three such distinct yet related meanings – Greek, late Medieval, and contemporary – creates a sort of dance-like energy between those meanings. The role of the writer/translator in linking them, as puns do, or as bodies do in a dance, provides a fourth meaning: the symbolic nature of such words to represent cultures across historical and etymological distinctions. Imagine, then, if you may, a maypole round which Maximus of Tyre, Robert Creeley, the prencipal scheiphirde, Robert Wedderburn (not the one who wrote The Horrors of Slavery, though, while in interlingual mode, why not? ), John Lennon dressed as a walrus (remember that ‘Mr. City policeman’? ), the Chief Superintendent of Tayside, and an unnamed drowned person, are all dancing to the music of what Pound defined as logopoeia, which the Scots poet Hugh MacDiarmid seized upon as something of particular interest to Scots, or, as here, anyone interested in the discourses of power and pleasure: ‘the dance of the intellect among words’. (The previous post involved me testing out and adapting one of Geddes’s ‘thinking machines’ – a little bit of neural coding, if you like. It helped me recognise that my tendencies to withdrawal, incrementalism, slapstickery, and to what I identified from a fascinating article by Charlotte Higgins on Phyllida Barlow as the ‘expedient’, do pretty much govern how I go about my given roles. Whether as pater, Makar, Professor, or poet, I tend to take the back seat, the low road, the long game, the one take – and to seek out and admire the work of those who do so too. I’ve mentioned Phyllida Barlow, but I’m about to head off to Oxford to the funeral of an old 80s friend, Helen Kidd, and I’ve been thinking of her work, how she balanced writing and teaching, in the light of one more sad loss, this time to Dundee poetry, Jim Stewart. In all three cases, these were artists who appeared to put their secondary vocation, as teachers, if not first, then in the stronger or yang position in relation to the yin of their art. In an unsubtle world that would seem a foolish thing to do. But my instinct is that, in an unstrategised way, they got something profoundly right, as Phyllida Barlow’s example shows. I just wish Jim and Helen had also had that late period flowering to explore the consequences of their decision, if clear-cut decision it was. I was just discussing with co-editor Richard Price elsewhere on social media how we’ve not yet got round to digitising Gairfish, the magazine we co-edited from 1989-94, when Jim Benstead requested permission to do exactly that to an old article of mine on MacDiarmid for Chapman. Way back then, we remarked, it was normal for there to be so many litmags, now it looks almost countercultural, a manifestation of what some have called Punkademia. Perhaps because the article was written so far back, I had no memory of its contents, and Jim had to send me a copy. I then found to my embarrassment that, in full-on MacDiarmidean mode, I’d used the article as a way to sneak in a couple of unpublished poems, which I had to request to be redacted from the article itself, (Though as the Scots poem was never collected, I’ve reproduced it separately on Tumblr). – An interesting case of rapid transition from far too far away to the closeness of over-sharing. But the circumstances prompted reflection. If we were, with our librarian’s and archivist’s hat(s) on (and what hats exactly do those professions favour? ), to digitise these publications, Richard and I were in agreement that it should be a matter of genealogies not archaeologies, pluralities not provinces, polystylism not perfectionism, contexts not prize-winners. In other words, a further editorial and, therefore, polemical act. Regrettably, of course – and this goes to the heart of why our early 90s endeavours may seem, firstly, ‘radical’ (because they fell outside the frame of activities subsidised and hence legitimised by arts bureaucracies and/or our universities), and, secondly, so very long ago – this would occur in a literary environment where we would routinely expect such acts not to be noticed, one where such work attracted no-sales not features, hatchet jobs not laudations, youthism not depth perception, retreads not identified traditions. In mid-career, ‘secondary’ writers and their editorial activities pass through the waist of the critical hourglass: journalism is focussed on youth, academia on the dead. In that formulation, youth ‘equals’ now, and the dead include primary living writers who have proven themselves to be ‘safe’ subjects. In order to be ‘safe’, publishers, the media, the bureaucrats, and in some cases the academy, require any author who is not already part of a functioning mainstream network to possess a single or dominant identifying characteristic of class, circumstance of origin, race, or sexuality. Their work should either reflect that identity, or at least be monothematic. Work which disturbs this direct mapping cannot, it is assumed, appeal to a broad enough readership to be of primary significance, and is therefore consigned to an unspoken category of far-offness: the Secondary. At this point in the discussion another friend (from Oxford in the 80s/90s), Keith Jebb, compared the relative importance of writers currently regarded as primary or secondary, and, naming no names (apart from that of Tom Raworth), we noted that while writing which is set aside as Secondary may well complicate the model set out above, it is also useful in casting light on all such acts of framing (as well as sometimes – as in the case of Tom Raworth – being very good at complicating things, as well as very good). One could indeed argue that it’s only by focussing on the Secondary that a meaningful critical perspective can be reached on the quick or the dead, the complicating or the simplified…but as someone aspiring to be a Secondary Writer, of course, I would say that, wouldn’t I? – and therefore one couldn’t. Could we nonetheless set up a Punkademic U, Keith wondered, not entirely flippantly, and I thought, not for the first time, that in such exchanges we sort of already have. I was reflecting on how I have come to use this and its brother and sister blogs in preference to conventional publication, whether in literary or academic journals, where I endeavour to continue to publish conventional work – reviews and those poems which ‘really will’ go into the next book. Here, however, it’s not simply or, rather, primarily a matter of freedom from editorial checks (and rejections), it’s more about a more exploratory approach, essayistic in the original sense of that term, in terms of both critical and creative writing. It’s about a closeness equally to the materials, in the sense of early stage drafting, to the means of production, i.e. ‘expediency’, and to a potential readership, i.e. you. Yes, there’s a big dash of what I’ve come to regard as The Bartleby Syndrome in that – a reluctance to engage with the PoeBiz of festivals, competitions, and commissions, the pecking orders and latest thing-ness, that many of my colleagues will recognise, although it pursues us even unto the fastnesses of Facebook, etc. We would prefer not to be doing something because it ticks someone else’s box, because somebody whose values we don’t necessarily rate thinks it will be popular. Sometimes, of course, the clearest manifestation of such commodifying, the commission, can be genuinely inspiring or liberating, and the strategy of using a commission to drive the development of a difficult new direction is part of any writer’s palette of creative strategies. This impulse isn’t really about rejecting the Biz, but about establishing a necessary distance from it, and therefore a closeness to, an intimacy with, one’s deeper processes. Of course this differs from ‘proper’ publishing, particularly proper academic publishing, in a number of obvious ways to do with rigour and accountability – with, in essence, that deeply problematic idea, seriousness. (When I was exchanging tweets on this matter with Keith, a comment of his prompted the couplet, ‘The joke’s the thing/wherein we’ll catch the conscience of the discipling’). Fundamentally, a blog embraces and seeks to better define that subjectivity both lecturers and students worry about when it comes to the marking, but wish to encourage when approaching the ideation. Part of embracing one’s Secondariness is getting down off those high distant horses, of doing something that may prove only to be playful or plain introverted – ‘hermless’, in the words of the song – of sharing rather than dominating. The Complaynt explores a subtly different configuration of that polity to that set out in Sir David Lindsay’s Satire of the Three Estates. Instead of the nobility, the clergy, and the burghers, Wedderburn follows Alain Chartier’s model in the Quadrilogue invectif (1422), and has Dame Scotia round rebarbatively on lords, priests and commoners (those ‘callit lauberaris’). These three remind me of the categories of the close, the land, and the lobby, and how these units fit into the larger frame of my city (Dame Dundee). It doesn’t seem too large a leap to say it was the priests’ role to establish our closeness or distance from virtue (God), while the nobles owned the land, and the commoners had only that last limen of their labour, in which their bodies and that of their families were, precariously, their own. But crucially, he also introduces at the outset (in the ‘monolog recreativ’ – where the echoing of Chartier’s title cannot be accidental) the mediating figure of the ‘actor’ or author, who plays a significant role in establishing the grounds for the complaint itself. In a sense, the author introduces, then acts out each part of the four way discussion. Perhaps then a helpful model for the poet of the polis might be to pick that configuration up, and one way of doing so would be to follow Patrick Geddes’s favourite division of the city, and therefore of society, into conceptual quarters: the lanes and closes and lands and lobbies our thought inhabits. When Geddes applies this to the medieval city, ‘he identifies as “people” two distinctive groups of the population: peasants in the country and burghers in towns. The chiefs are the barons or nobility. The regular clergy in abbey and monastery are intellectuals, and the secular clergy in the cathedral church represent emotionals.’ We can see this as a sort of composite echo of the divisions in Wedderburn and Lindsay. 4. the clerics as ‘emotionals’ (media and artists), its bosses being press barons and bureaucratic mandarins. Each of us has a role or more than one role in relation to these four categories. and it is in the interactions between the roles, and between the roles and the power structures they contain that we begin to glimpse our individual social responsibilities, our closeness to or distance from power. Thus, in the first of these quadrants, like many writers, I am a worker and, like some, a parent (particularly, a ’pater familias’). In the second, I’m a voter and tax-payer, who can be called upon to be a juror, and, as a poet in a localised public sense of the term, a ‘Makar’. In the third I’m a professor (equally lecturer, practice-based researcher, and administrator), and, typologically, a ‘creative’. In the fourth I’m an author (therefore understood to be employable as a reviewer or broadcaster), though, as pointed out above, actually in the problematic category of ‘poet’. So if we observe how the major/minor, empowered/disempowered division operates in each quarter, I’d say that in some of these cases I may find myself switching between major and minor positions, but, in several, like most poets, I occupy the less powerful bracket. Thus a worker is not a boss, but a father can be, wittingly or otherwise, an agent of patriarchy; a voter is not a councillor, but a Makar has a (sort of) public voice; any professor has a considerable amount of status, but a creative one may be seen as unorthodox, not quite academic enough; and while an author may well be an opinion-maker, a poet may be perceived as shouting in a bucket. To the extent that each writer divides their roles between such categories, we can plot out our areas of relative strengths and weaknesses, our closeness to the communities we are part of, and, crucially, our distance from those who would control and administer them, and thus, to the extent to which a writer can plan anything, we might just be able to determine where our energies could be best spent. (A short disquisition on how sideboards do furnish a room, in which I’m thinking about types of closeness: how close we get to – or should approach – those lives we thought we might lead. How distant the writer might be, or want to be, from those he or she writes about. The element of retreat in this reminds me of the suki no tonseisha, those writerly monks who retreated to their temporary huts to contemplate transience in medieval Japan – Bunting’s ‘Chomei at Toyama‘ being one reconsideration of this motive, simultaneously ascetic and aesthetic, with just a dash of Bartlebyism in the mix. Similarly, I suggest, Hugh MacDiarmid wanted to get away from the couthiness of the close, to become uncouth. I find myself fantasising (in the sense that nothing I do quite amounts to planning) about augmenting the inherited furniture of my rented tenement flat, given that it is a mirror image of my grandmother’s flat, with my grandmother’s sideboard – which was itself the ‘virtual sideboard’ of a lost novella, written on holiday in the 90s in the darkness of a Tenerife holiday bungalow while my partner and infant daughter slumbered in the bedroom, my ‘inspiration’ fuelled by half bottles of three year old whisky with names unheard of in these parts – Auld Perth, The Highlander’s Delight, Prince Stewart’s Own Blend. The novella, as far as I can remember anything about its plotless meanderings, simply located all my memories and fantasies about my childhood and Dundee somewhere in the recesses of the sideboard, and so too folded away the past itself like a tablecloth, or the vast thick table mat that was brought out every time my great-aunts and-uncles foregathered to play cards (always ‘Horsie’, or Newmarket), which could be accessed by crawling into it a la Narnia or a Tardis. It sounds and presumably was terrible. This gesture would then reflect and reinforce the way that my current stay in Broughty Ferry is itself a simulacrum of my lost ‘Life in Dundee’ in my thirties and forties when I was in fact earning a living for my family in Newcastle (ie being a grown up), but somehow ‘should’ have lived here. That mirror imaging is the key to the sideboard/garage/archive/forgettory: I’m in a simulacrum of my twenties: following a life like a life I ‘want’ to lead, just not enough to actually do so. Thus the weekly visits to my mother in Monifieth reverse the polarity of my treks up the Perth Road in the eighties (via Groucho’s and various vanished second-hand bookshops) to Gran’s flat. Thus my constitutional walk of a Sunday is not past the Castle and along the sandy beach, but in the opposite direction, to the yacht club and the Stannergate. 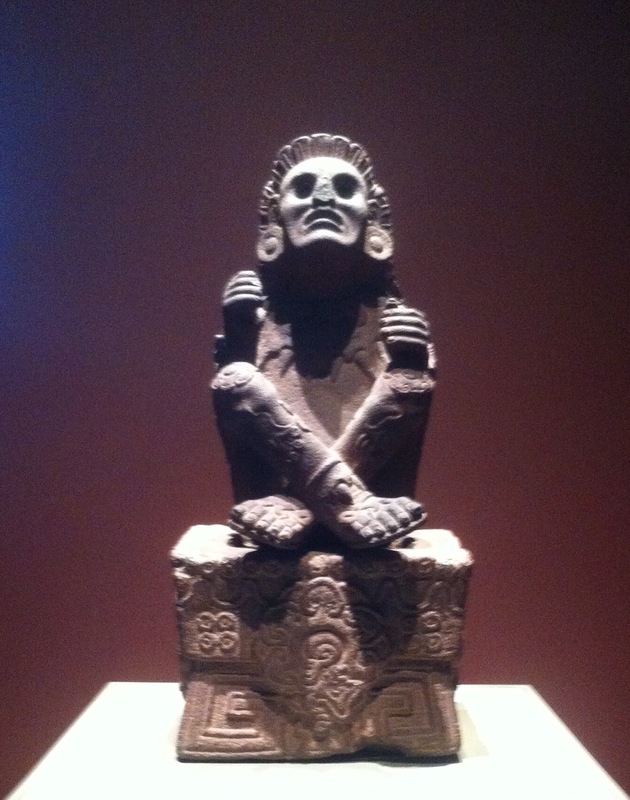 Thus the whole practice becomes a bad shamanism, trying to make something straight and simple which happened to follow its own kinks and arabesques. Thus the weekly breakfast at Visocchi’s; the stimulating diet of pies or bridies from Goodfellow’s; the diurnal purchase of the Evening Telegraph; the hour of devotions to that Tullie or staring at the Tay in one of the set quartet of public houses, The Ship, The Fisherman’s, The Phoenix, Mennie’s; the purchasing of Braithwaite’s coffee despite misgivings about this being some sort of proto-hipster gesture; the visiting of the DCA where once it would have been the Steps Cinema – these are all attempts to imitate a life, and are indeed an imitation of life. But there are virtues to be glimpsed among the errors I have led myself into. My fascination with the contrary writers of nineteenth century Dundee – whether the working class figures associated with the kailyard, the genuine innovators, or that peculiarly Flarf-like strain of deliberately bad writing that led to Dundee’s yurodivy, the Holy Fool McGonagall – folk like James Easson, ‘Poute’ (Alexander Burgess), and James Young Geddes – has led me to reconsider those Dundonian values Michael Marra characterised as ‘hermless’ in a manner that would have appalled that great dismisser of all poetics but his own, Hugh MacDiarmid. 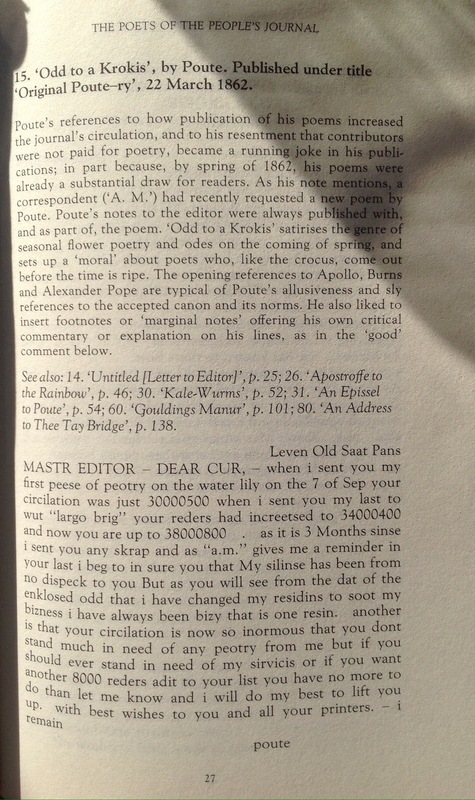 His dislike of poems which were in his opinion ‘like a dog when it loves you’ manifested itself in a marked rejection of closeness in the sense under discussion here. MacDiarmid wished to flee the sentiment and nostalgia of such nineteenth-century poetry – symbolised for him by the Burns Cult, and, metonymically, by the use of the Burns stanza, with its tightly-packed rhymes and dimeter and trimeter lines – precisely because it was so proximate to him. He wished to escape from the closeness of the toun, that place where he actually lived – be it Langholm, Montrose, Whalsay (the toun as island as whale), or the ironic homophone of Biggar – into the conceptual space of international Modernism: the continental, the cosmopolitan, the urbane. In short, the eternal city, the city of the world’s desire, the city of God, the city that never sleeps – anything but the Scottish city with its transferral of the horizontally parochial to the vertical of the close. MacDiarmid’s mode was always to foreignise, to make strange and other and separate what it is that the (Scottish) poet does and is – though in doing so he conformed to a rather conventional Romantic notion of the distance between the genius and his (always his) genealogy. Because his politics would not allow him to retreat to the ivory tower, he favoured a more extreme vertical still, the Tower of Abstruse New Song, in particular the upper floors of that brutalist structure, the long poem, ‘The kind of poetry I want/Is poems de longue haleine – far too long/To be practicable for any existing medium’ – in the words of the Chinese poet Yang Lian, he wished to ‘begin from what is impossible’. I’d like to try instead to think of a summation of the poet’s role as far too possible – a polyphony of possibilities, or an irreducibly plural series of roles that have to be assessed, categorised, and assigned priorities – the multi-tasking of a close-dweller, or citizen of the polis, a participant, however inept and/or reluctant.